I'm thinking about putting a catch tank on our '21 Touring for the radiator overflow. I don't care about a recovery system but I hate for people to freak out when we park at a cruise in and the car pushes out some water. It deosn't puke out much but a little looks like a lot on the pavement underneath the car. Anybody use one? And no it won't be a beer can, not on my car. Unless your car has an overheating problem, you are filling the cooling system too full. As the water heats up it expands and overflows. If you leave it about half way down the top tank, when the engine is cold, it should not spill out when it warms out. Be sure and check that it is actually about half way up and what you see is not a wet baffle. Shake the car a bit when you check to see the water bounces around. I agree, let the T find it's happy spot. I might add a little coolant in the spring, let it expand overflow, and let it be happy all summer. 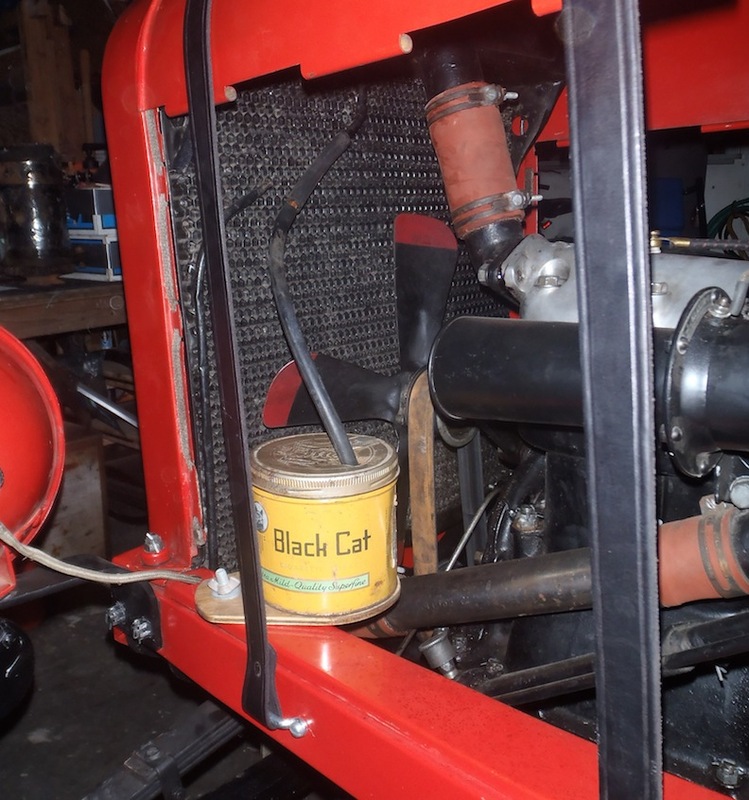 I agree you shouldn't need one if your coolant is at the proper level, but just for conversation, here is one I ran a couple years ago on my '24 Speedster. We were running at the local "Street Legal) drags (bracket racing) and one of the rules required a coolant overflow tank be installed. It stayed dry the whole time. Norm is correct. If your radiator is OK it will barf out any overfill. You can put in too much and the car will correct it for you. As long as there's enough to cover the baffle you're OK.
Until the overfill is barfed out, people will be telling you something is leaking from your car. I had one guy follow me into a parking lot just to tell me I was leaking coolant. Installed a temporary plastic overflow bottle just to find out how much was overflowing. So far, the quart bottle is about 1/3rd full. Overflow appears to have stopped at this point. If the radiator is still pretty decent you won't need an overflow tank. Barfing out water is caused by to much coolant in most instances. Try it and see. I put a royal crown whisky bottle for a over flow which the car never uses. People at car shows really like the bottle. Royal crown bottles are real fancy.